"When you meet a person with a disability, assume they are capable." 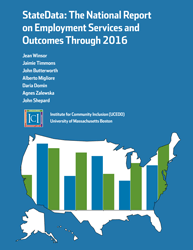 Access the latest information about employment and economic self-sufficiency for people with intellectual and developmental disabilities. Both national and state-level statistics are included. Brian lives in Reno, NV. He has been employed since high school in jobs related to music or computers. Recently, Brian's family has supported him to develop and run a business that adds a useful service to a local music store. Ian lives on Oahu, Hawai'i, and enjoys movies, dance, and karate. He is employed as a courtesy clerk at Safeway. With the support and high expectations of his family, he was able to train for this job while still in high school, enabling a smooth transition into the kind of work he wanted. Ryan has been interested in nature since he was a small child, and once asked only for plants for his birthday. He lives in Reno, Nevada, likes math and science, and describes himself as a positive person. With his teacher as his job coach , Ryan transitioned from high school into the perfect job. Izzy is 23 years old and lives with her family in Tampa, Florida. She loves swimming, working out, and baking. An internship at an assisted-living facility and related classes at the University of South Florida's Learning Academy helped her succeed later at her first paid job. Francesca lives in Philadelphia, Pennsylvania and works at the William Rowan Elementary School as a teacher's assistant. All her life, she has been interested in a career helping children. She began working in the school system as an AmeriCorps member, did very well, and was offered a paid job.